New Russia in Syria is looking very much like the old one as Putin seeks to regenerate the Empire. The UN is blocked from acting in Syria in significant part due to the Russian veto within the UN Security Council. Perhaps Putin’s Moscow does it for Bashar al-Assad, its only ally in the Arab World, but also just to show that it can. (Washington also hides its lack of will behind the Russian veto as well as its antipathy toward the ICC – international criminal Court – by failing to press for Syria to be referred to the war crimes Tribunal). The end result is that the UN is starting to appear a lot smaller in some people’s eyes while Russia is a stiff, outsized icon of its former self. Read our Blog for Film – “Can Annan/UN Afford to Look Away from Syria Crimes”. 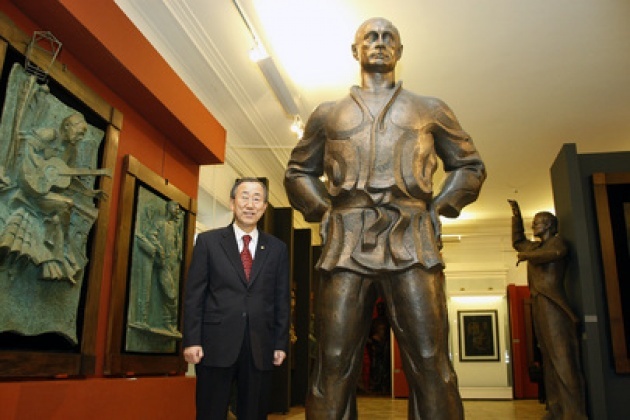 Above UN photo was taken on March 17, 2010 in Moscow with UN Secretary-General Ban Ki-moon posing next to a statue the then previous and now again Russian President Vladimir Putin in Moscow. (The Statue is the work of Zurab Tsereteli, at the Tsereteli Gallery in Moscow).